The Salisbury University MBA at Perdue School of Business is offered in an accelerated one-year, fast-paced format online and in a hybrid format. The courses in the program cover such topics as marketing, accounting, finance, and information systems. Graduates will be equipped with the skills they need to make good judgment calls, work in a team environment and develop business relationships. Those who wish to complete the program in a part-time format can do so in two years. 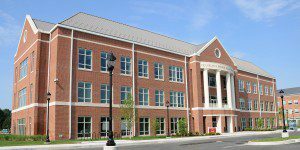 Salisbury University MBA students must complete an approved program of a minimum of 30 semester hours, and complete all MBA requirements within seven years of the end of the semester in which MBA coursework began. When students begin the program, they are expected to have background knowledge in foundational business topics, as well as possess standard verbal and computer skills, and basic knowledge of algebra, calculus and information systems and technologies. In addition to the 30 credits required for the program, students may also need to complete foundation courses totaling up to 12 more credits. MBA-program courses include: Accounting Concepts and Application, Managing Strategically, Strategic Marketing Applications, Business Economics, Managerial Finance, Analytical Customer Relationship Management, and others. The Salisbury University Online MBA can be completed in as little as nine months and be taken 100 percent online, on campus, or a mixture of both. A total of 59 students are currently enrolled in the Salisbury University MBA programs, with 34 enrolled full-time and 25 enrolled part-time. Full-time students are evenly split, with 50 percent male and female student. An estimated 26.5 percent are of minority status, and 5.9 percent are of international status. The part-time program features slightly more male students (52 percent), with 20 percent minority-status students and 8 percent international students. The average age of full-time students is 26, while the average age for part-time students is 32. • Graduate In-State/Resident: $404 per credit hour. • Graduate Out-of State/Non-resident $724 per credit hour. In total, over the course of 30 credits, the Salisbury University Online MBA tuition cost is $12,120 for Maryland residents, and $21,720 out of state. Students can file their FAFSA by October 1. The deadline for priority funding is March 15, and students should apply as early as possible in order to have the best chance of receiving funding. The School of Business offers several scholarships, some of which students may be considered for automatically, and some of which require an additional application. Interested students should check with the school in order to determine the application requirements for these scholarships. Applicants to the Salisbury University Online MBA program must have completed a four-year degree in any field for admission. A $65 non-refundable application fee is assessed prior to application submission. Applicants are required to submit an official transcript from each college or university they attended. U.S. institutions may send official transcripts electronically or in a sealed envelope (no exceptions). Foreign Transcripts must be submitted in their original version, in English, with a GPA listed on a 4.0 scale and with credits comparable to SU credits. Otherwise, a professional course-by-course evaluation of all foreign academic transcripts is required. International applicants must have a TOEFL score of at least 550 (paper-based), a 79 on the IBT (internet based test), or an IELTS score of at least 6.5. Three letters of recommendation are required for the, regarding professional or academic performance of MBA applicants from qualified individuals. Letters are handled via an online recommendation system that is part of SU’s online-application process. Additional application requirements include a current resume, GRE or GMAT scores and an admissions essay. Professional experience is not required. Points may be added to the formula-score totals for qualified work experience at the middle-management level or higher, with supervisory/budget responsibilities.